The Puente Nuevo is one of Ronda’s most famous landmarks, in fact the bridge is one of the most photographed manmade structures in Spain. The interpretation museum is inside the bridge, in the large room under the road. At verious times this has been a prison, a hotel, and a bar. Descending the outside steps visitors find themselves standing on a wide ledge overlooking the gorge, and giving a great view of the arches of the bridge up close. You can also take a photo through the arch to the mountains. Then enter the bridge and climb a short staircase into the central room, which contains a detailed history of the bridge, why it was needed, how long it took to build, and how it was built. From here it is also possible to look through the doors of the room to the valley below. 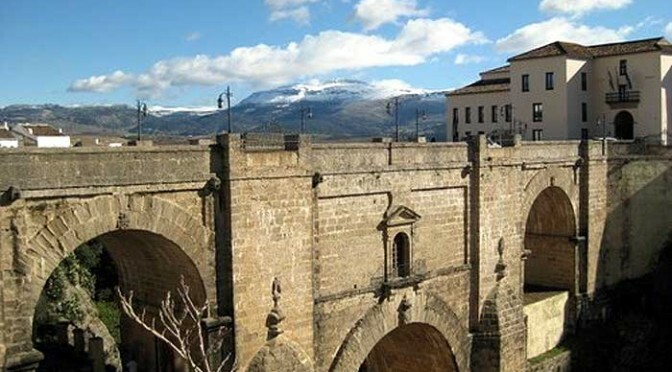 To get into the interpretation museum of the Puente Nuevo simply descend the steps on the north side closest to Ronda’s Parador Hotel. You’ll need to pay 2€ per person but the view of the gorge below and the photo opportunity of the hills in the distance taken through the arch of the bridge is well worth it.